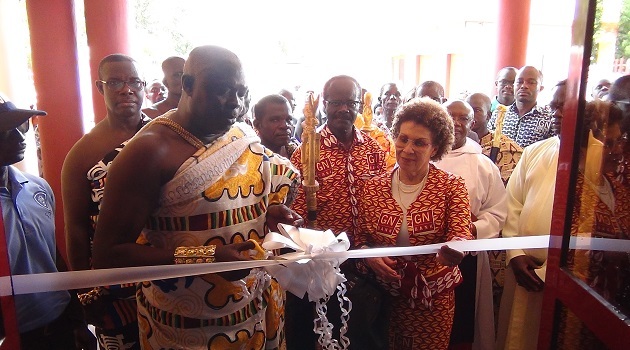 Groupe Nduom (GN) bank has opened a new branch at Mpohor in the Wassa East district of the Western region. The bank also has 8 branches in Liberia, Togo, Nigeria and Ivory Coast. Speaking at the opening, Dr. Papa Kwesi Nduom, the President of the Groupe Nduom said he was very proud to open a branch at Mpohor because it was his vision to make GN bank the biggest bank in Ghana. GN bank is filled with excellence to bring development into people’s lives and the country as a whole. He further explained that GN bank was ready to serve the country and provide financial support to the government in times of difficulties. Dr. Nduom asked Ghanaians to support local banking so as to remain formidable and competitive in the banking status so it can be of help to entrepreneurs to finance their businesses. He encouraged the people to pen accounts with GN bank and take advantage of numerous products and services offered by the bank. He also admonished the staff to work diligently for the bank to grow. The Western regional manager, Mr. Nii Koi Kortey commended the Bank for its vision in its quest to support the town and its neighboring communities. He noted that GN bank is mainly there for its customers to provide them with the very best of banking services. The bank will need the support of the people to grow excellently. He also encouraged the people to open accounts whilst taking advantage of some of their products like the GN mobile money and E- banking and also entreated the staff to develop good attitude and be courteous and be concerned about providing good customer care. Mr. Herbert Buabeng, a customer of GN bank praised the bank. He stated that, he has been in business with the bank for some time and he can testify that GN bank is currently one of the best bank in the country.